You've been driving for an hour or two or three. You pull off at the rest area, use the facilities, and then walk around a bit. 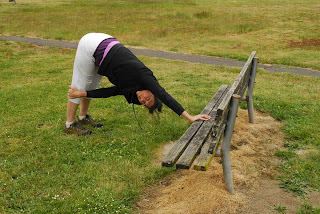 Find a bench and do some stretching. It'll do your body wonders. side of your low back, stretch into each armpit, arch and flex your spine, gently rotate the head, and then slowly come into a long deep stretch. 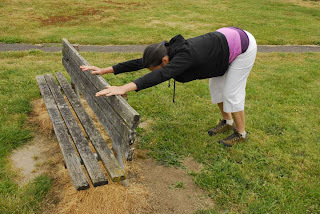 If you have more hamstring and low back flexibility you can do the same pose with your hands on the seat of the bench rather than the bench back. This position brings you closer to classic Adho Mukha Svanasana. This variation will work better if you are in the deeper variation of bench dog. From the bench dog above you reach your left hand to your outer right calf, knee or thigh. Then rotate your chest to look out from under you right shoulder. Your hips stay level and your spine rotates. Spend some time on each side, continuously lengthening and twisting your spine, opening your shoulder and stabilizing your hips. This is the first installment. Try these out anytime, at the rest stop, your neighborhood park, in your garden.